For Bobbito Garcia ’88, making hip-hop history was all about being in the right place at the right time. From 1990-98, Garcia co-hosted The Stretch and Bobbito Show on WKCR, where he and Stretch Armstrong become gatekeepers for a generation of hip-hop golden age luminaries. It was on Stretch and Bobbito that unsigned artists such as Nas, Jay-Z, Busta Rhymes, Wu-Tang Clan, and the Notorious B.I.G. first premiered new music and introduced themselves to a generation of fans. In 1998, The Source Magazine named the show the greatest hip-hop radio show of all-time. Garcia’s influence on popular culture extends beyond the pivotal role he played in breaking classic records. He hosted Madison Square Garden’s “Hot Minute at the Half,” becoming the first Latino broadcaster in the New York Knick’s history, served as an voice for a series of NBA Street and NBA 2K video games, and wrote “Where’d You Get Those? 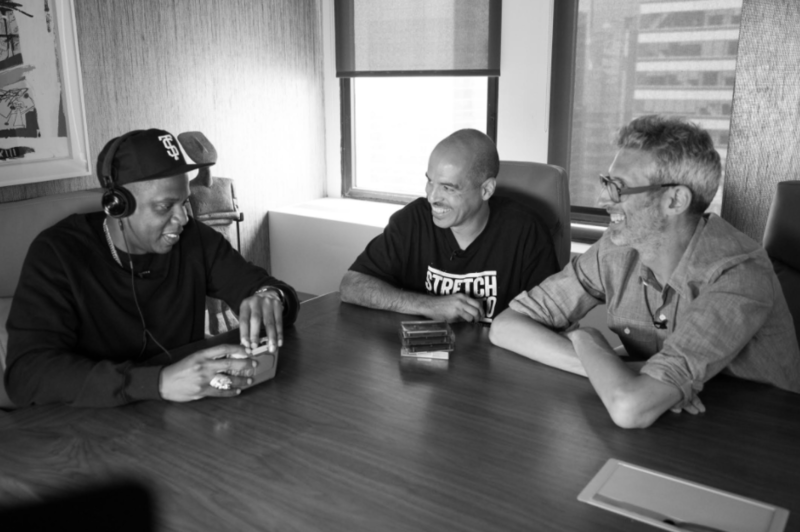 : New York City’s Sneaker Culture 1960-1987.” His new film, “Stretch and Bobbito: Radio That Changed Lives,” will be released in December on Netflix, and is available now on Showtime and stretchandbobbito.com. Garcia sat down with The Argus to talk about the new film and how the internet has changed hip-hop. Argus: So tell me what the reception to the film has been. What’s the message you hope to get across to viewers? Bobbito Garcia: In April of 2016 it premiered on Showtime, and by the time this article comes out in The Argus it will be available on Netflix as well. So, the film has really exceeded expectation. I think one of the reasons why is because it speaks to a time that cannot be replicated and has been sort of lost on younger people if they didn’t experience it. For sure, we have all the people who were there and listened and were fans of Nas and Biggie and Wu-Tang and Jay-Z and Eminem when they were all unsigned and unknown, when they were appearing on our show. But on the flip side, we have a lot of younger people who were blown away by the film, by the culture of taping and music that is inaccessible as opposed to the current state where everything is accessible. We are thankful to have the platform to tell our story and share it. We are happy to get a little ink in The Wesleyan Argus because that’s where I went to college. A: Now that content is so accessible, would a program like “Stretch and Bobbito” be possible in the internet era? BG: No, absolutely not. Just think if there was no internet and a friend of yours mentioned a song and you were like, “Oh man, I want to hear it. ” You have to wait a week. You can’t just go online and do a Google or Youtube search. After you wait a week, there is the chance that that next week the song isn’t even played, because in the 90’s there was so much great music that we would play songs and possibly never play them again. And people would go crazy, like, “Can you please play that Kool Keith record?” [We would have to say] sorry we played that a month ago. So it’s a different culture and for those who did tune in on a regular basis, we had a cult following, because they wore it like a badge of honor and went to school or work the next day and they had music that no one else had at all. Both Stretch and I put a lot of effort into presenting the very best hip-hop available in the world in a four-hour time slot every week. So it’s pretty compelling. I think the film does a great job of describing what that sentiment was through not only the voices of the popular artists like Busta Rhymes and Common, but also our interviewers with our listeners that no one knows. People like Vaz and Grand Ghetto. And to me, as a director and writer of the film, it was just important to tell their story as it was the multi-platinum artists. A: So when you meet young artists today, is there a different way they carry themselves because of the way celebrity and the internet has changed the medium? Has there been a shift in their relationship with the media? BG: I don’t have any relationship with rap in this day and age. It would be better to ask yourself. But Stretch said something really interesting to me recently, which was in the 90’s, when we were on the radio, artists really had no choice but to focus on the art. I mean when people heard Nas, Biggie, and Wu-Tang on our show they didn’t know what they looked like. They didn’t have any social media presence because there was none. They weren’t required to post a Youtube video because there was none. So the only way the artist could make their mark was through the strength of their lyrics and production. Whereas now, it is plausible for someone who is not that talented to garner an amazing international following by virtue of other means – presentation, look, aura. All of which are important to building an artist. But there used to be a real focus for excellence and I’m not saying there aren’t artists today who don’t have that same focus by any means, but it just seems like there are other ways to become a well-known and popular artist than back then. A: So when people came on Stretch and Bobbito, as opposed to how artists maybe approach radio now, was there a sense they really had to bring it – that this was their one opportunity to gain greater exposure? BG: That’s what Eminem says, that he was nervous when he came on our show and this dude has sold over 150 million records now. Jay-Z said his appearance on our show was one of the reasons he got known. Nas said that coming on our show was the biggest thing to happen to him in his career at the time. And I really encourage everyone in the Wesleyan community who reads this article to watch the film and know that, I was not on WESU from 1984-88. I didn’t get on radio until 1990 with Stretch at Columbia University at WKCR, and I had zero experience. I was a fan of WESU, I used to tune in and listen to UCONN’s radio station as well, that’s how I used to get my hip-hop fix. But in terms of being on the mike as a personality that came a lot later. A: As opposed to your street basketball documentary, was there something more difficult about making Stretch and Bobbito considering that you yourself were the subject? BG: Well both of my documentaries are at least semi-autobiographical [Garcia’s first film “Doin’ It In The Park: Pick-up Basketball, New York City” premiered in 2013]. But, at the same time it’s revealing and sharing the story of an entire community. My third film, which is in the works right now, is titled “Rock * Rubber *45s”, and is an autobiographical documentary of my life and career, so now it’s going to narrow the lens to just my narrative. I can’t tell my story without telling the story of others who mentored me, like Russell Simmons and my parents, so it will still be a shared narrative. But with me and Stretch’s film, I had to be aware that it wasn’t just my story, it was a shared story. So I had to make sure it was fair to everyone, Stretch, the artists, and the listeners. A: Did you have the feeling during the Big-L and Jay-Z “7 Minute Freestyle,” or when Nas came to promote “Illmatic,” that these would be historic moments in the history of hip-hop music? BG: There was no sense, in that there were enough talented artists that came through our doors that never got signed or never became big, so it was always a question mark. This woman or this man is phenomenal, does this mean they are still going to sell records? The music industry wasn’t a true meritocracy. The only meritocracy that existed was in the late 80’s. It boggles my mind when people say the 90’s was the golden era, because actually the only time that the best hip-hop artists sold the most records was in the mid-late 80’s. If you look at the top selling artists of the early 90’s, it’s like MC Hammer and Vanilla Ice, who are both horrible (laughs). But for the artists that were respected by the art form and the community, and who had respect for the culture, then it was a great era and Stretch and I were very happy to be gatekeepers for it. A: Reflecting back on the differences between these artists who did blow up and those who didn’t, do you think that was mainly because of luck and the conventions of the music industry, or something else that you can pinpoint? BG: There are so many factors. The work ethic of the artist, the timing, the label support, the willingness of the audience to accept them. There were artists that were before their time, ahead of their time, after their time. There are too many variables to determine. We didn’t really care if people sold records or not, that wasn’t why we did the show. We only did the show because we loved the music and we loved the artists that excelled at it, and we wanted to share that with ourselves and the listeners. And that’s it. The fact that Jay-Z went on to sell 75 million records and Nas’ Illmatic is critically acclaimed as perhaps the best hip-hop album of all time, that is a byproduct not any more special or more deserving of applauses than MF Doom premiering his demo on our show or Company Flow premiering their demo on our show. There are too many stories to be told.